In November I started a Flickr set named As Pretty as an Airport, after a Douglas Adams quotation. This was intended as a challenge to myself—to create beautiful photos of buildings that are, on the whole, notoriously ugly. 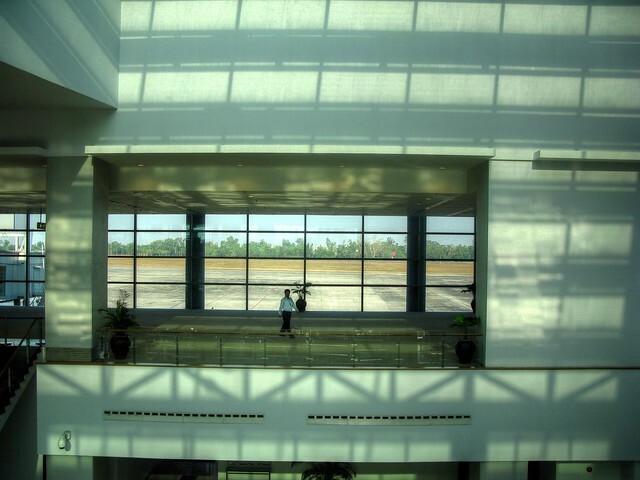 Returning from BarCamp Yangon I had some time to kill at Yangon International Airport, which I thought was going to be particularly challenging to photograph until I noticed the patterns of light on the walls. This is probably my favorite in the series so far. This past weekend I was fortunate enough to attend BarCamp Yangon, the first BarCamp to be held in Burma/Myanmar. 2,700 people attended over the course of two days. Six rooms were available, and all were in use almost constantly. This level of participation at a BarCamp is unprecedented to my knowledge. The organizers did an incredible job of managing a crowd that vastly exceeded expectations. There’s clearly an appetite for such self-organized events in the city, and it will be fascinating to see what other events this first BarCamp inspires. I was one of a half-dozen or so foreigners in attendance, and we were served by an enthusiastic and capable translation team of around the same size. On Saturday afternoon I gave a presentation about Web single sign-on using SAML, a technology that I know little about but have had cause to study recently. About fifty people attended. I had two translators, madyjune (who has English-language accounts of both days) and Angelo. They both did a fine job translating what was a fairly technical presentation, although I suspect much of the audience didn’t really need the translation. At one point I asked how many people were actively involved in creating or maintaining Web sites or Web-based applications. Only three people raised their hands. Later I asked how many knew what XML was, and only one hand was raised. In both cases I found the number of affirmative responses shockingly low. My impression was that there were a number of factors that make it hard for Burmese to get involved in Web development (at least on a personal level rather than as an employee of a company or government organisation), including unreliable and filtered Internet access, and difficulty in registering Internet domain names. A couple of the examples in my presentation used examples that involved e-commerce (although there’s nothing in SAML that’s specific to e-commerce scenarios). Belatedly I realized how inappropriate those examples were. E-commerce doesn’t exist in Burma. Neither do credit cards. Compared with most major cities in the region, Yangon feels quiet, calm and uncrowded. Infrastructure is underdeveloped by regional standards. In other cities, if the electricity grid goes down it’s viewed as a minor disaster; in Yangon it’s practically a daily occurrence, and is generally met with humour. Most major buildings (universities and hotels for example) have their own generators. This isn’t just prudence; it’s a necessity. Mobile phone roaming services appeared to be unavailable. Mobile phone data services appear to be unavailable even to locals. There was no Internet access in the hotel that I stayed at. Many bloggers I met told me they would update their blogs more frequently if not for unreliable Internet access. Internet access at the BarCamp appeared to be unfiltered, but I understand that this was a special concession by the country’s two ISPs to the BarCamp organisers. Many Web sites—including popular blogging sites, YouTube and Twitter—are generally blocked. (Facebook, which was blocked in Saigon when I last visited, appears to be tolerated in Yangon.) It was clear that most of the technically-literate BarCamp attendees were well aware of how of circumvent these restrictions; however, presumably the same isn’t true of the population at large. People don’t talk about politics much. This could be taken as apathy but is more likely caution—I have been told that Burmese are strongly discouraged from discussing politics with foreigners. On the few occassions the topic was raised I got the impression that people generally hold the junta responsible for their country’s relative poverty.